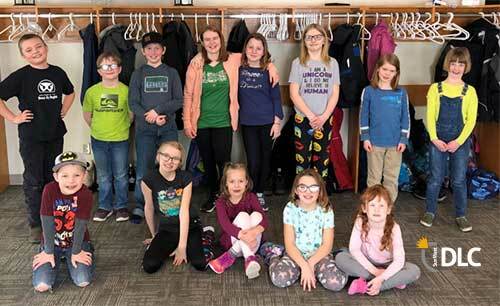 Thirteen students aged seven to 12 years of age along with five of their parents attended a fun-filled but also very educational Sun West Distance Learning Centre (DLC) Learning Camp on March 13 in Kindersley. Organized and facilitated by DLC K-9 Department and Personalized Learning Coordinator Kathy Grad, the camp included hands on science, art and physical education activities that kept the students busy while also keeping a smile on their faces. At the camp, Kathy taught the students how to apply some basic aeronautical principles by creating their own whirlybirds. Made with paper and scissors, the students had a great time making their whirlybirds and then dropping them to the ground to see how their paper rotors worked similar to that of a helicopter. They also enjoyed creating a paper box using the principles of Origami. The DLC holds Learning Camps as well as other activities to bring home-based students and parents together on a regular basis. The DLC encourages all parents to consider attending. Announcements about upcoming events will be forthcoming as dates grow closer. The students who participated in the DLC K-9 Learning Camp on March 13 in Kindersley.